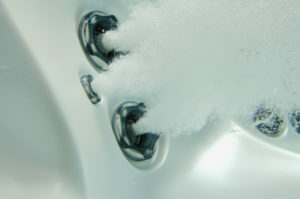 Make sure bacteria doesn’t make your Hot Tub its new home! Here’s how to make sure it doesn’t happen. After each use, make sure all jet ports are opened so that water is able to flow through them freely. If you have any diverter valves, turn them half way so that water is moving through every bit of plumbing at once. If you have a waterfall feature, make sure it is opened just a bit to ensure water can move through it as well. The best way to defeat bacteria is to keep up sanitizer levels and make sure the water is able to circulate through your tub. If you notice, when checking your levels, that your sanitizer levels are dropping, that’s a pretty good indication that it’s fighting bacteria. Ensure that you check often and hit it with sanitizer as needed. For more information on hot tub water care, check out our Water Care FAQ page. Contact your Beachcomber Hot Tubs, Pool & Patio Water Care Technician at 403-327-7665 for more information on how to keep your water sparkling clean!